The cookies were inspired by two rather adult treats – buttered rum and rum raisin ice cream. Despite their inspiration, these chewy cookies have a butterscotch taste and can be enjoyed by cookie connoisseurs of all ages. Bring rum to a simmer in a saucepan over medium-high heat, taking care not to bring to a boil. Add raisins and remove pan from heat. Cover and let sit for at least an hour. You can allow the raisins to soak overnight if you wish. Preheat oven to 375 degrees Farenheit. Prepare cookie sheets with parchment paper and baking spray. In a skillet over medium-high heat, brown 11 Tbsp of butter. Melt the butter, swirling the pan to keep it from burning. Browning should take 2 – 3 minutes; when the butter is a deep brown and starting to smell delicious, it’s done. Transfer the browned butter to a large, heat-safe bowl. Add remaining 5 Tbsp of butter and stir until melted. Whisk granulated sugar, brown sugar, salt, and vanilla into butter. Whisk in eggs. Gently stir flour and baking soda into the butter-sugar mixture. Fold chocolate chips and rum raisins into dough. Roll dough into heaping Tbsp sized balls and place in evenly spaced rows on prepared cookie sheets. The amount of batches you work in will depend on the size of your oven. Bake 10 minutes. 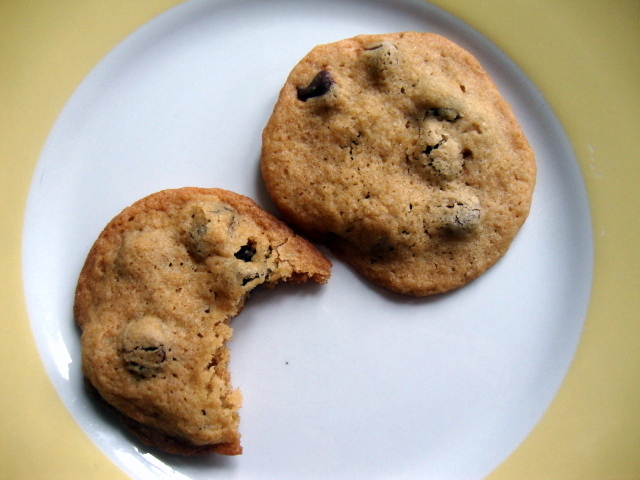 Carefully remove baked cookies from sheets and allow to cool before serving.